Merry Christmas Eve! The Websters celebrated with a candlelight church service and new pajamas for all. What are your Christmas Eve traditions? We usually attend Christmas Eve candlelight service at our church. Then we binge watch our favorite Christmas movies and open a present. Going to Church I guess... Never done anything else. This christmas we had a sunday morning service, sunday night service and christmas morning service in 25 hours time. It's awesome. My parents,Grandma (Dad's mother) and I celebrate Christmas with Dad's family. Don't go to church. Let my niece and nephew open one gift. We had all of our children here for Christmas except one. It was great! Happy birthday JESUS!!!! 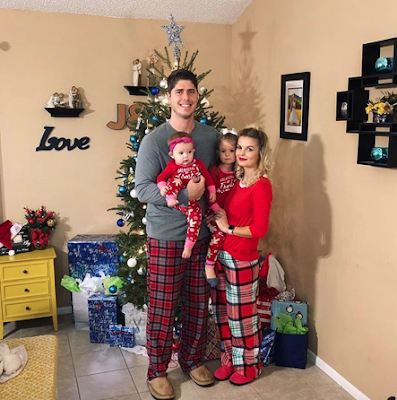 Did Alyssa get to spend Christmas Day with her family? Cute family. Boy does Alyssa look thrilled. Isn't that sweet, the little girls even wear their bows to bed! Such a cute picture!! We had a candlelight service, but my youngest and I stayed home with the flu. Not the best Christmas Eve we've ever had. Their family is just as mine was - I had three baby boys in 1964, 1966 & 1969 and was so happy. Our Christmas Eve was spent hanging stockings and having cookies & milk. I cherish my memories as will John & Alyssa. Not to fast forward their lives, but time goes by so quickly. Enjoy every second of every minute these ARE the best years of your lives- happy new year to the Lovely Webster Family.